Dr. Mario Andreis, the last eighteenth-century offshoot of a pharmaceutical dynasty with roots in the eighteenth century, bought in Carrù in 1896 the pharmacy and grocer, with relative right of the square, by Dr. Giuseppe Bonardi, giving rise to the twentieth century history of Andreis pharmacy. An expert pharmacist, Mario Andreis significantly strengthened the exercise, not hesitating to participate, with its products at international events. In 1905 he received, at the famous Crystal Palace in London, the Grand Prix with a gold medal for the display of medicinal plants, spices, elixirs and pharmaceutical preparations. Subsequently, starting from 906, he received prestigious awards in the international exhibition in Genoa and in the international exhibition in Antwerp. The diplomas are all present in the pharmacy, with artistic frames. 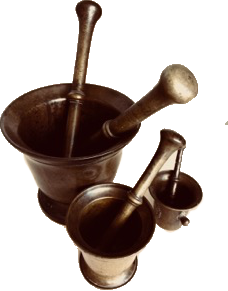 Dr. Andreis had particular skills in the treatment and correction of wines, in the preparation of alcoholic and vinous dyes, the writings and formulas pinned in the old notebooks of Doctor Mario refer to the time when they set up veterinary medicines, elixirs, tinctures, cachets, ointments ; time when the glass was blowing for the preparation of the vials, the time when the modern pharmacist was born from the old apothecary. The pharmacy, in part still owned by the Andreis family, has seen within its walls, from generation to generation, the work of a long line of pharmacists. Art and pharmaceutical passion, knowledge of plants and spices, interest in wine have been handed down over the years, from Dr. Mario to Dr. Riccardo, from Dr. Mario Romano to Dr. Franco Andreis who, with Dr. Michela Tomatis and Nerina Prandi keep their culture and tradition alive, keeping the pharmacy intact in its refined structure. Continuing in the wake of a consolidated tradition, the pharmacy team today is composed of only pharmacists, who with enthusiasm and passion dedicate their time to customers with attention, professionalism, competence and friendliness. Among our characteristic productions are the Tillare Sacra Rabarbaro, the Enoleo, a liqueur of digestive herbs and the Spice tisane linked to the territory of Carruccese, the line Dermocosmetica Fleur Noisette which brings with it the colors and aromas of the Langhe, fascinating landscape of the Piedmont, UNESCO heritage of humanity. The environment in the pharmacy is characterized by a splendid late neoclassical shelving, punctuated by fluted columns with highlights in gold. In the center, between two griffins, stands out a rich emblem, which can be interpreted as the tree of life. The sales counter, dating back to the first half of the nineteenth century, presents inlays with stylized images of medicinal plants, while the ceiling, created between the late nineteenth and early twentieth century, provides a splendid example of the floral taste tied to the Liberty. The lumens facing downwards, once made of gilded wood, complete the exceptional whole that has come down to us. If you come from Carrù, come and visit us!